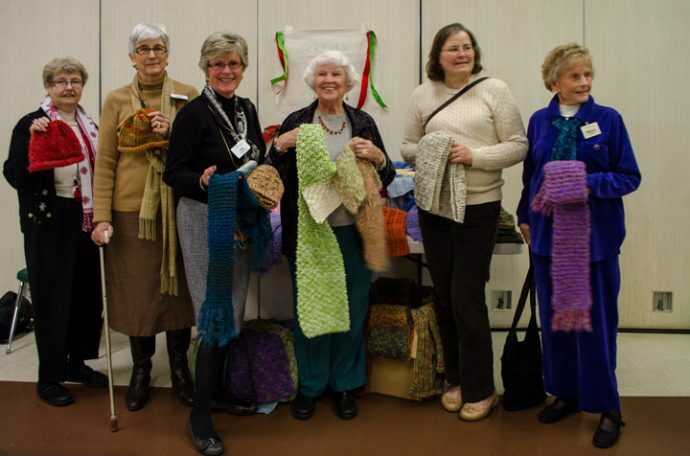 In March of 2007 several women envisioned a prayer shawl ministry here at DCC. The work of their hands and hearts has touched more lives than can be measured. In these nine years they have crafted and gifted over 200 prayer shawls, 65 baby blanket and cap sets, with several dozen of those going to new babies in families at Dayspring Preschool, and many scarves which have been given to church family and friends. A prayer goes with each gift. In addition, for the past few years they have given 250 hats and scarves to the Christmas offerings at St. Anthony’s Kitchen in San Francisco and many to the Winter Nights program DCC helps to sponsor. Some of those who knit and crochet have come and gone but most have remained and new ones keep appearing. They meet on the last Wednesday of each month, usually at the church and occasionally in a home. The Diaconate funds supplies from memorial gift offerings and there are also private donations as well. Amazing grace indeed! We thank these dear ones for sharing the labor of their hands and the love in their hearts with so very many. New members are always welcome!